The 12th annual ACDIS conference in Kissimmee, Florida, starts in 20 days. As you make your final preparations to leave in just a few short weeks, the ACDIS team has some reminders to ensure your trip goes smoothly. First, make sure you visit the ACDIS Blog regularly. We’ve been posting helpful tips to help you get the most out of the conference and we will continue to do so as the date approaches. We also list the previous week’s blog posts in CDI Strategies, so be on the lookout for anything you might have missed there, too. Second, we will be using the ACDIS conference app again this year, so be on the lookout for instructions on downloading and logging in. Attendees will receive detailed instructions via email about their login information. We do not print materials for attendees, so the app is your way to access all the presentations at the event and connect with other attendees and speakers. Finally, as a reminder, the ACDIS office will be closed for the conference starting Friday, May 17, and will reopen Tuesday, May 28, after Memorial Day weekend. We look forward to seeing you in Florida! Wear comfortable but professional clothing, comfortable shoes you can walk in, and bring extra layers (such as sweaters or jackets). We have no control of the temperature in the convention center and it may fluctuate from room to room. Also, remember that no outfit is complete without your conference badge. If you arrive at the conference without it, security cannot let you into the exhibit hall or conference session rooms. Day 1 of the conference is always “CDI pride day.” We encourage you to wear purple and orange. In the past, attendees have sported purple ties and orange shirts, fancy hats, and scarves. It’s not just about having fun. Donning ACDIS colors lets other attendees know they’re in good company and makes it easier to strike up a conversation in the elevator or on the way to the educational sessions. We’ll be giving out spirit ribbons for those who go above and beyond. Day 2 is always “state pride day.” We encourage you to wear an item of clothing emblematic of your state such as Red Sox baseball cap or Hornets jersey. 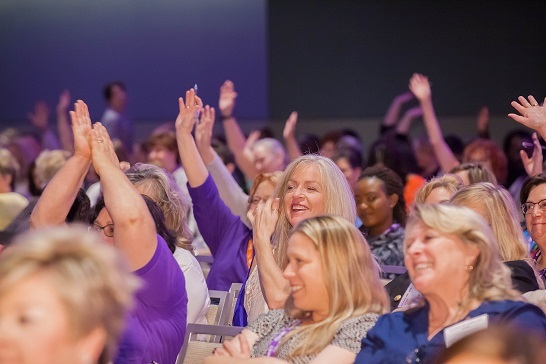 Visit the local chapter page for your state to stay up-to-date on what the chapter leaders have planned for this year’s event and be on the lookout for an email from ACDIS staff about conference chapter happenings. Local chapter leaders often hold after-hour meet-ups for attendees from their state/region. On Day 2 during the lunch break in the exhibit hall, ACDIS encourages local chapters to select a few tables to decorate with state-themed paraphernalia. Again, while a ton of fun, the real impetus is to help facilitate networking opportunities for both first time and veteran attendees. It’s easier to recognize a Saints shirt than it is to try and read the fine print on someone’s badge. Those arriving on Monday, May 20, should pre-register and pick up your badge and your bag of goodies from 2 p.m. to 6 p.m., from the registration desk in the conference hall. Just follow the signs. The welcome cocktail reception takes place around the same time from 5 p.m. to 7:30 p.m., in the Exhibit Hall. ACDIS also holds a Closing Night Awards Reception after hours on the last full day of the conference, Wednesday, May 22, 5-6:30 p.m. The ACDIS team hopes to see lots of friendly faces joining us to celebrate our 2019 ACDIS Achievement Award winners and network with colleagues from near and far. Registration for this event is separate from conference registration. Tickets are $25 in advance and are available on a first-come, first-served basis. Admission includes two drink tickets and appetizers. Space is limited, so don’t miss your opportunity to join the celebration. Call customer service at 615-724-7200 to get your tickets if you didn’t purchase one when you registered for the conference.